At the heart of Phnom Penh city, this well-appointed hotel with over 400 rooms / suites and serviced apartments on bustling Monivong Boulevard 20 minutes from the airport and moments away from the Embassies, Banks, Ministries and the business district is the place to be. Within walking distance and picturesque Buddhist pagodas, French colonial mansions and a wealth of shopping havens laden with treasures plus a wide exciting range of entertainment and dining venues from the world over. 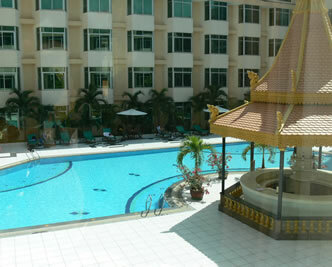 Cambodia is an enchanting country rich in tradition, culture and arts. We are pleased to extend royal treatment as you pursue business or pleasure in the Kingdom of Cambodia with our unique combination of luxury and comfort. Phnom Penh Hotel in larger map.